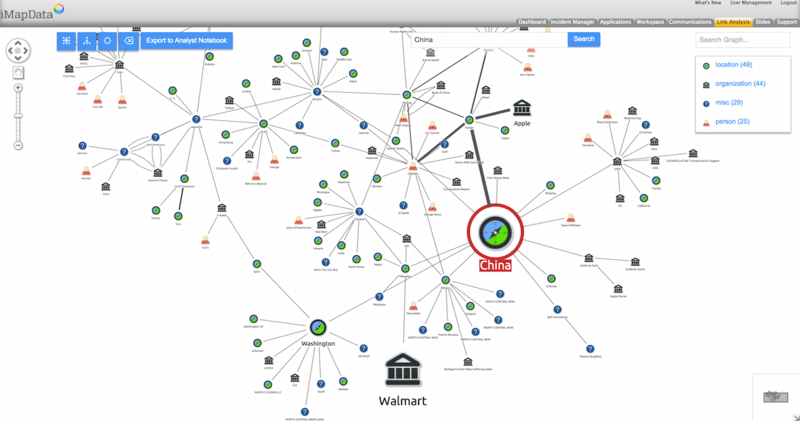 Screenshot of the AIMS™ social media exploration component, showing connections between corporations and other entities, derived from mentions on social media. 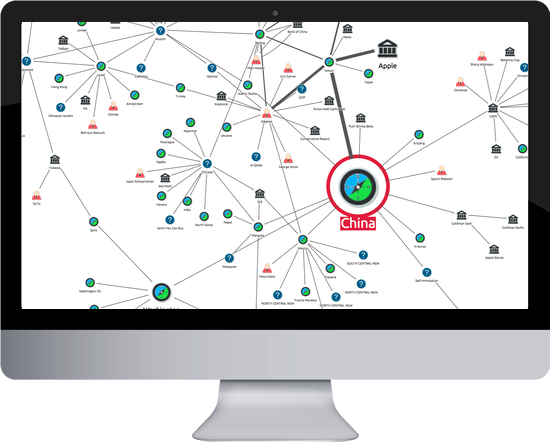 This case study explains how iMapData have used the power of the KeyLines network visualization toolkit to help customers understand and mitigate risk. iMapData use KeyLines to visualize risks in social media data. Visualization component was ready for customer deployment within three weeks. Users report saving hours, or even days, on data discovery activities. The Smarter Way to Mitigate Risk™ is iMapData’s tagline. For the past 30 years, they have worked with Fortune 500 companies and US government agencies, helping them to identify, understand and proactively mitigate risk. From their McLean VA base, they manage a 24/7 data collation and cleansing operation, bringing together vast volumes of information about their customers’ critical assets. Customers then access and analyze this data using the Advanced Intelligence Management System™ (‘AIMS’) – iMapData’s SaaS platform. AIMS™ contains a suite of data exploration, analysis and visualization tools that empower organizations to identify, assess and respond to risks as they evolve. In August 2015, iMapData released a KeyLines network visualization component for exploring and analyzing social media datasets. Three-quarters of online American adults use social media. Facebook has nearly 1.5bn active users worldwide. In this environment, organizations serious about risk need to be looking at their social media footprint. 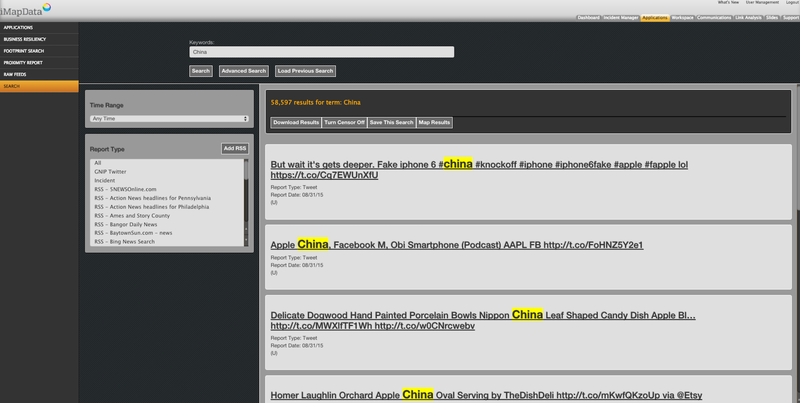 iMapData’s legacy social media search component. With a combination of natural language programming (NLP) algorithms and a powerful keyword search function, users are able to explore iMapData’s huge curated social media databases. Results are presented in list form, with hyperlinks between related documents. “Our customers’ problems change every day. There are new threats, bad actors, and vulnerabilities emerging across the globe constantly, exposing our customers to real harm. As such, it is vital for security analysts to be able to rapidly discover risk information related to their interests – whether they be people, brands, social media accounts, or other entities. Compatible – The AIMS™ platform is designed to bring critical intelligence data to users, anywhere in the world. Compatibility with different devices and browsers is essential. Extensible – AIMS™ is a growing and evolving platform. The visualization solution would need to be compatible with future growth and development. Feature rich – iMapData add value to their data through a year-round program of manual cleansing, but also by providing sophisticated end-user analysis tools. The network visualization solution would need a rich and evolving library of functionality that could be incorporated into their application. Speed of integration – iMapData look to continuously improve the value provided to their user community. Significant enhancements like visualization would need to be implemented quickly and efficiently and maintain the high standards of performance expected by their demanding users. The iMapData Product team reviewed a variety of options, including a commercial Java-based data visualization technology and D3.js. “We quickly reached the conclusion that the other commercial technology would not be suitable for us. As a Java-applet based product, it failed to meet our important compatibility criteria, and also lacked extensibility. Then we began to explore building our own native solution using D3.js. We were pleased with the compatibility and extensibility the library offered, but it lacked the rich functionality we needed. It would have required a tremendous amount of development input to build even a simple network visualization component. In July 2015, the team set to work building a production-ready KeyLines component. Within just three weeks, a candidate was ready for deployment to government and commercial customers. Following the release, usage of the text-based legacy social media search tool plummeted as users took advantage of the more intuitive network visualization approach. “Our customers are delighted with this new approach to data exploration. We have transformed real-time discovery on massive data sets from a laborious process of reviewing lists to an accelerated graph analysis. Our customers have reported that the data discovery activity has been reduced by hours – even days in some cases. For over 30 years, large commercial organizations and the United States government have relied on iMapData’s expertise and intelligent solutions to proactively mitigate risks to their organizations. The flexible, robust and scalable iMapData solution adapts to support their clients’ needs in the most dynamic of threat environments. iMapData’s Advanced Intelligence Management System™ platform seamlessly integrates the functions of business continuity, situational awareness, force protection and risk management. The solution includes global incident monitoring by iMapData’s trained analysts in a 24/7 Risk Assessment Center, as well as complete mobile communications. Visit www.imapdata.com for more information.